Aside from losing sleep over the health and well-being of the eliminations, and the children who are moving them, there is the issue of the ickyness. Maybe it’s because my children were in daycare until a few months ago, but I do not remember things ever being as icky as they have been since I’ve been home. I’ve learned a few tricks, and I’m trying to keep them readily on my mind, because when I need them, there is no time for thinking. Around the time of my second baby, my friend showed me the not-so-secret technique of opening the new diaper and placing it under the baby’s bottom before even opening the dirty diaper. I think this is to quickly cover a mid-change spray, but I find it helps contain messy changes. If I miss a little spot with the wipe and set baby’s bottom back down on the pad, it’s going to leave a stain, but if a diaper is there, it’s just a tiny smudge on the new diaper. Big whoop. This has put a stop to stains on my white diaper changing pad covers. This isn’t like a huge life-saver, but it definitely makes life easier. 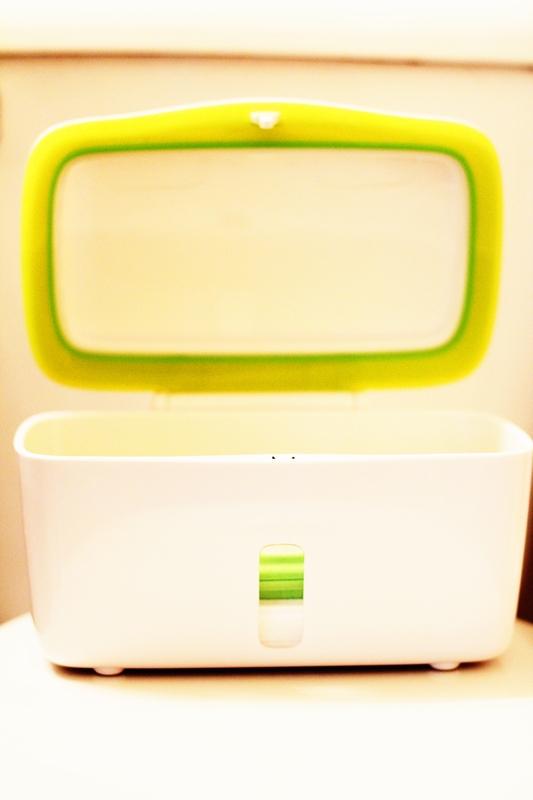 The Oxo wipe box is sooo nice. Where do I begin? It has a push top lid, so I don’t have to have a free (or clean) hand to open it. I can use my wrist, elbow, knee, whatever, and the box opens itself and stays open. It is properly weighted, so it doesn’t tip over, no matter how full or empty the box is. The inner ring/weight keeps the next wipe standing tall and easy to grab. You know how frustrating it is to scratch and scratch for a wipe while baby is rolling over and crawling away. It also prevents the wipes from coming out in an endless chain. I know conservation is not the thought of the moment when cleaning a mess, but honestly, I can’t clean a baby with a wipe scarf. That just makes a bigger mess. And when I close the box again, there is a rubber seal to keep the wipes moist, unlike other boxes. Wish I knew about this two kids ago, but I love it, and will probably find a reason to always hang on to it. Sorry, Honey. Its smell isn’t bad, and neither is its appearance, but baby poop clings to clothes worse than blood or anything else I’ve ever tried to scrub out. 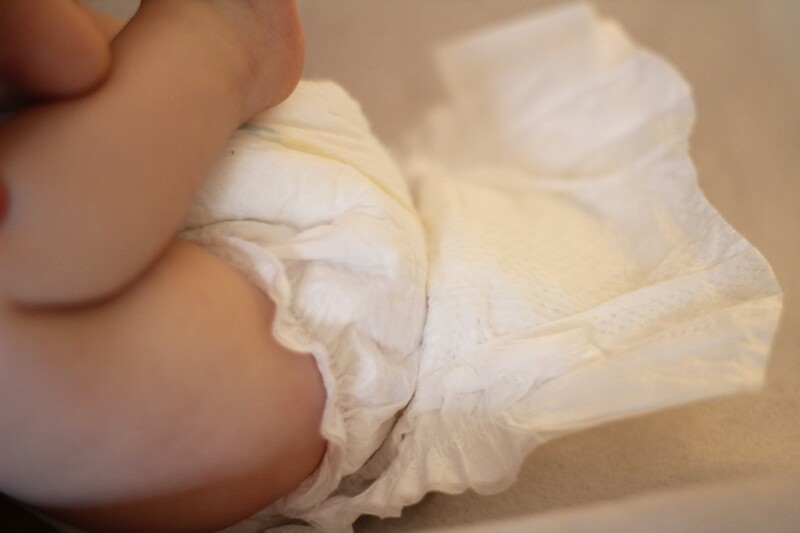 My children only seem to have diaper blowouts when wearing white, or my most favorite outfits. One thing I have learned, and have to constantly try to convince Daddy of, is you can pre-treat, but whatever you still see after pre-treating will still be there after washing. In other words, scrub it until it disappears. Don’t count on the washing machine for anything. While this is a fact worth knowing, it doesn’t get the stain out. I’ve scrubbed for hours, and it doesn’t come out. Or I get it to fade, but the fabric is now worn and pilled up. Ugh! My friend taught me a wondrous trick that I wish I knew two children ago. I’d have a lot more cute hand-me-downs if I’d known. 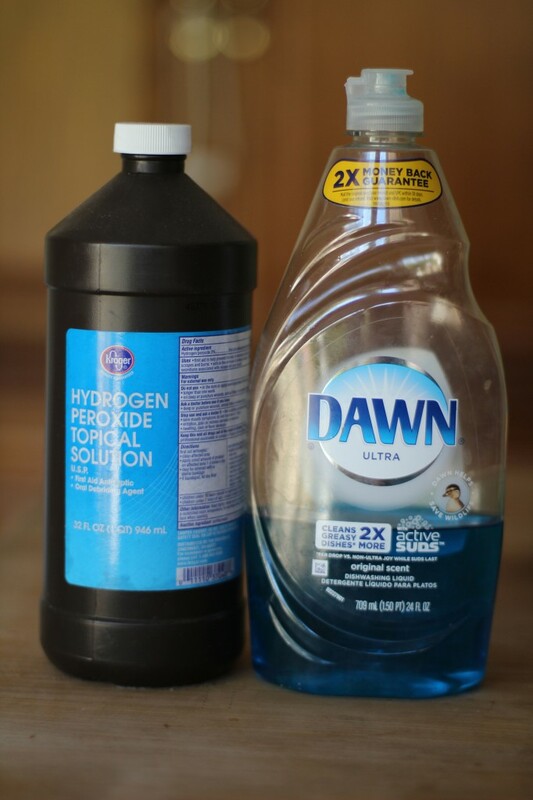 The solution I use is two parts hydrogen peroxide and one part dish soap. I like the idea of keeping this in a spray bottle for smaller stains, but I’ve needed it for entire outfits. I immediately soak the clothing in cold water with the solution added. I don’t even scrub. I let it soak a good, long time. If the stain is still there, I gently rub it, and let it soak longer. I try not to break down the fabric, but instead choose patience. This technique actually gets the stain completely out, which is more than can be said for the fabric cleaners. Score! I also tried this on blood, which disappeared instantly. Baby poop is way more stubborn. 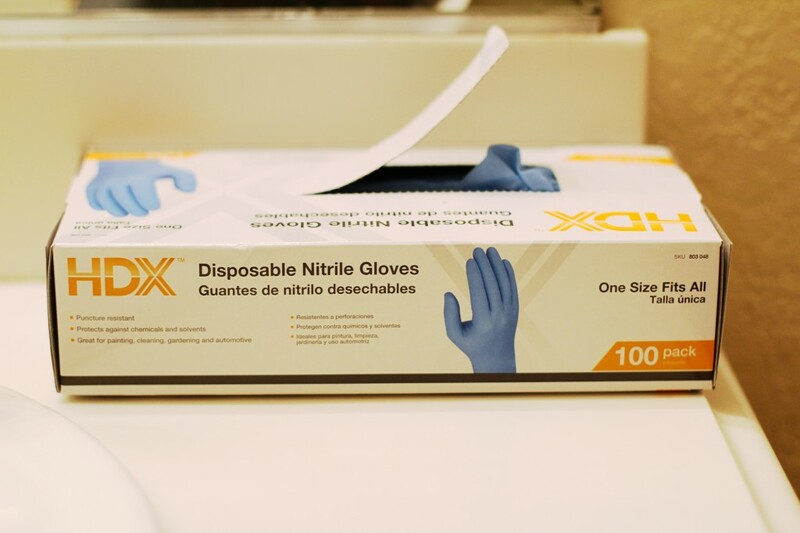 I don’t know why it took so long to break down and buy a box of these disposable nitrile gloves, but now that I have them, I go through a few a day. They’re kinda like baby wipes. So versatile. How did we ever live without them? I’ve had to clean up so many accidents that left my hands stinky despite repeated scrubbing. And honestly, I can clean faster if I’m not heaving from the overwhelming disgustingness of what I feel on my skin. When disaster strikes, this is my first step in the response. I wear them for everything from stripping the child, to scrubbing the child, and scrubbing the floor. Now, I think I’ll wear them when scrubbing the bathroom. I can’t believe I’ve been scrubbing the toilets with just my hands and wipes. Ew! I won’t tell you the horrific stories I have of absolute ickyness I’ve had to clean up. You’ll lose sleep or have nightmares. I’m not kidding. But needless to say, accidents happen, and for me, they’ve happened enough that I now have procedures for carpet care. In case you have been a very tidy person like me and have no clue how to clean up your worst nightmare, because it hasn’t happened yet, this should take some of the guesswork out of it. First, I remove children from the area. Then remove items that are clean (e.g. small furniture, toys, books, etc.). Then, I scan broadly to see how far-reaching this disaster has struck. Next, I assess scrutinously, so as to not step where I might later regret. I bring with me disposable gloves, paper towels, carpet spray (maybe even the hydrogen peroxide-dish soap solution- I haven’t tried it yet), a warm, damp towel, and a dry towel. 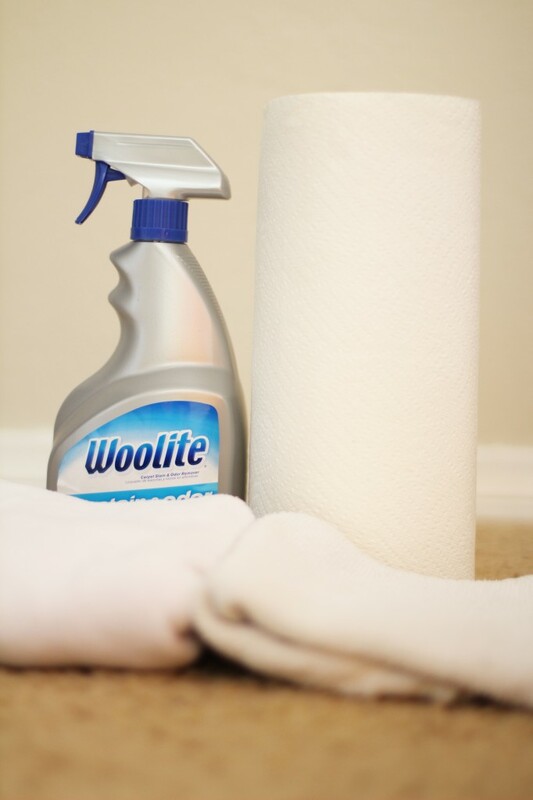 With gloves donned, I collect any solid, large, loose, or dry pieces onto a paper towel and dispose. If there are puddles, I dab with paper towels to absorb the bulk of the liquid and dispose. Once it is merely damp, I lay the warm, damp towel over the affected area and apply pressure to absorb. This is the most effective step, a tip from my carpet-cleaning brother-in-law. If desired (mostly based on level of soil), spray carpet cleaner and let sit. I drape paper towels over the wet areas so, later, I know where they are. Come back and scrub with another damp towel, and absorb with yet another damp towel, if necessary, then absorb with the dry towel. I open a window, and close the door to continue to keep the kiddos off the damp area while it dries. If it’s really damp, I’ll add a fan. Can you tell I’ve done this a few times? I can sense you imagining what has happened in my house. But I won’t tell you, because it’ll never happen to you anyway. I was doing this routine one to five times a day for several days at a time. I thought the world, or at least my paper towel supply, was coming to an end. The sooner I accepted that it was going to be a way of life for a while and I have to just clean it up, the sooner I got over it and moved on, as then did the kids.